- Membership is open to anyone within the Riverside, California area and its neighboring communities. - New members are welcome to join at any time. - Memberships are based on household unit. - Membership year is June 1 - May 30. - Initial membership dues vary and depend on when you join. - To join, you must complete the application located on this website or download the application and mail it to us. CLICK HERE: Membership Application Form 2018 (PDF) to download. In all cases, membership dues must be paid prior to final approval of membership. - To provide social and cultural activities through which new residents may become acquainted with other newcomers and the community itself. - NOTE: If paying by credit card a technology / convenience fee of $1.25 is added to your dues. - All members agree to the terms of a joining agreement at the time they join the club, and they agree to the terms again at each annual renewal. - An annually elected volunteer Board manages the club. - The club operates from a set of Bylaws and Policies and Procedures. - Members may not associate Riverside Newcomers & Neighbors with any commercial enterprise. 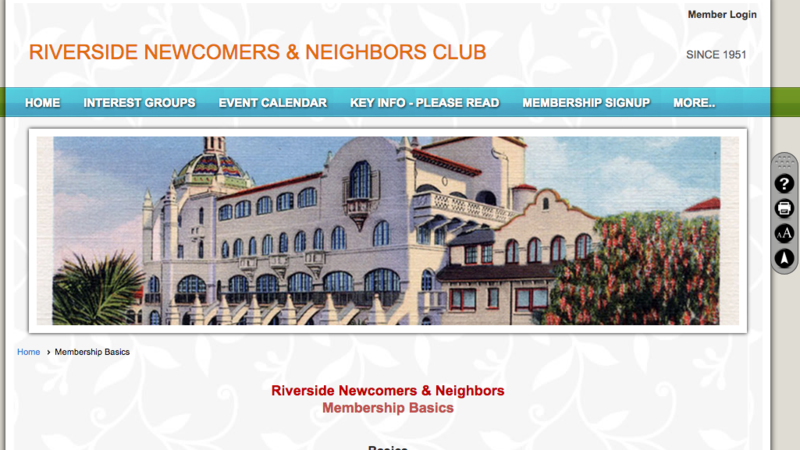 - The Riverside Newcomers & Neighbors directory is for personal use of the organization and its members. It is not to be used for solicitation of any kind or shared with others outside of Club. 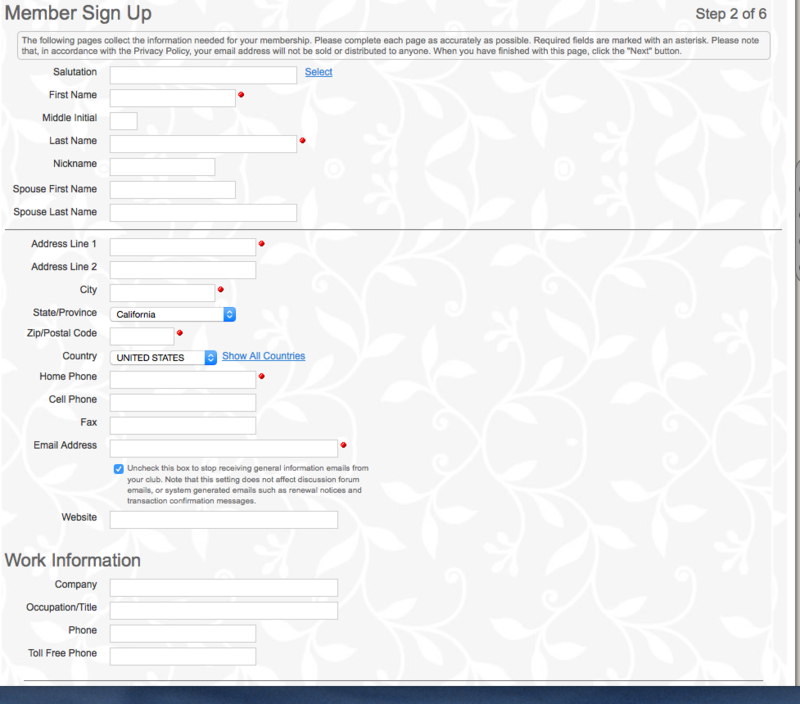 Select " Membership Signup" and this will take you to the starting point of the membership application and Step 1. Member Sign Up Page 1. Select "membership type" by payment method. Tell us how you heard about us. Member Sign Up Page 2. Fill out your personal information and contact information. Interest Groups. Please select the Interest Groups you may have an interest. This action does not commit you to anything -- only indicates your interest. You will be added to contact list. 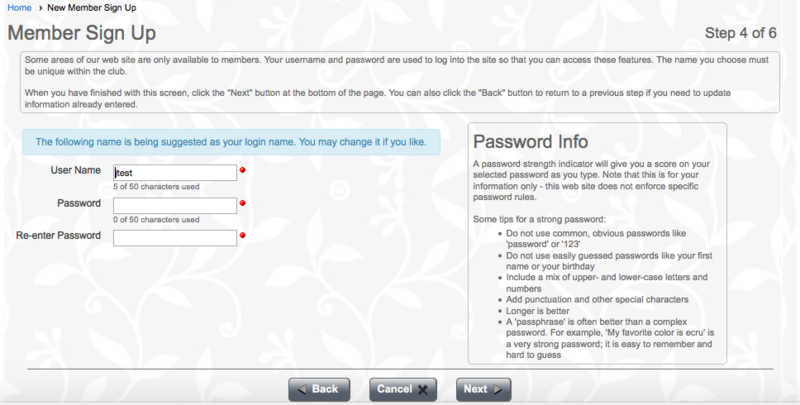 Website User Name and Password Selection. Member Sign Up "Joining Agreement". You will need to read the agreement and if you agree select "I Agree" to proceed. 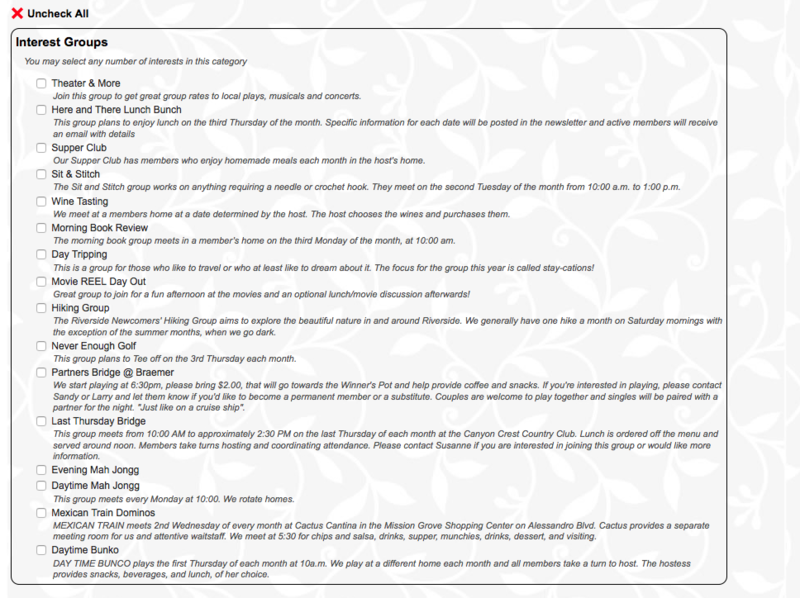 Confirmation page of Personal member information and Membership Summary. Please review information for accuracy. If all items are correct, you will need to select " Submit Application". The system should generate a message to you indicating membership application is complete and access to website is granted if paid membership is done by credit card. If you are paying by check, the club membership recorder will need to receive and process your check prior to final membership. If you have questions, please contact us.